This is the first summer that Counterbalance Roasters roasted all the coffee offered at the shop. Mercedes has been roasting with her husband, Rafael, on Queen Anne hill - behind his violin shop. They formed Counterbalance Roasters this past May. Counterbalance Roasters takes it name from the top of Queen Anne hill. The counterbalance was a tram system, balanced by weights, that would take passengers to the top of the hill. The original tram still sits under Queen Anne Avenue. Mercedes, the owner of Ghost Alley Espresso, is a skilled home cook who relies on intuition & smell when cooking. Her experience cooking, in business and in the coffee world direct Counterbalance Roasters offerings. She carefully chooses the green beans, creates the roasting profiles and lovingly fills each retail bag offered by Counterbalance Roasters. Rafael is a world renowned luthier and has been a part of the Queen Anne community for 30 years. His skills; restoring fine instruments, creating varnishes, and responding to the individual needs of his customers lend themselves to the art of roasting coffee. He is patient when roasting and eager to work with green beans from unique locations. Rafael's son, Alex, also roasts coffee for Counterbalance Roasters. A jazz musician and recent college graduate, Alex is a natural at roasting coffee. He is especially good at well balanced medium roasts. Together the three roast in a tiny converted machine room behind the violin shop. They use a Diedrich 2.5 roaster. Green beans come from many origins and two are purchased directly from farms in Central America. The Pike Place Market during December is a wonderful place to shop. Every Christmas my father would go through the craft line looking for presents. My brother and I have continued that tradition. On the craft line this year there are many things I have my eyes on; jewelry (Sabando Designs has a silver necklace in the shape of the molecule of caffeine), cutting boards, pottery, scarves & handmade bags from several designers. These are all things for my own wish list! For family & friends a Market basket filled with goodies is a great gift. Filled with food items, dried flowers, flour sack towels, and coffee (of course) a Market basket is a unique gift. Every Tuesday a bright blue cargo box shows up just outside of the espresso shop, pulled by bicycle. In the box are all sorts of wonderful things; pastries, newspapers, juices and Middle Fork Roaster's coffee beans. Our beans are delivered by bicycle! Freewheel Cargo is located on Capitol Hill and delivers goods throughout Seattle almost every day of the week. The founders are committed to carbon free delivery and supporting small businesses in the Puget Sound. We look forward to our deliveries each week and we are a little jealous that our delivery riders get to spend their days trekking around the city with the aroma of fresh roasted Middle Fork coffee wafting behind them. We have used the modbar in Ghost Alley Espresso since November 2014. It has completely changed the way we make espresso. The machine allows us to mimic any espresso machine in the world with its unique pressure profiling. Over the summer we pulled a single origin Brazilian bean with a very simple profile; 8 seconds of pre-infusion, 26 seconds for the pull. Now we are back to using a full city roast and the machine is set to pull like a Piston Lever machine. 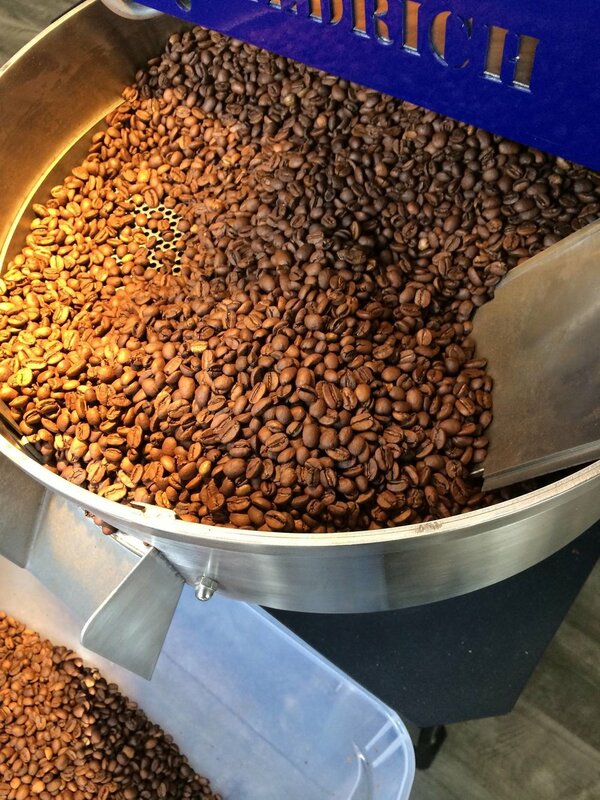 The modbar allows us to extract each different roast in a custom way. We tested our own version of this drink on some of the Market workers over the summer. While we can not state this is an actual cure* we did find this helped after a late night and a few too many. *Not a medical claim, not for tea drinkers. A Van Diemen is a drink that purportedly helps a hangover. It consists of Ovaltine, chocolate, castor sugar, pineapple, water and full-cream milk. The milk fat helps with nausea, the water hydrates, the sugar revs you up. Not sure what the pineapple does. The "Hangover Cure" is a 16 oz iced quad Ovaltine mocha with sea salt. We take a heaping scoop of Ovaltine chocolate malt, add dark chocolate, grind sea salt into the drink, pour four shots of espresso in and add cold milk and ice. For the full effect - make it a breve and get all that good fat delivered to your belly right away. If that doesn't do the trick, perhaps compliment our rich chocolate drink with a fresh pineapple from one of the Market fruit stands? Located in the number one tourist location in Washington we often get asked "what should I do while I am here in Seattle?" There are so many things to see and do. It's an incredible city. Of course the first thing we recommend is having a latte, grabbing a map, and sitting in the Alley. At our shop we have maps and brochures for attractions we recommend. The Seattle Coffee Crawl put on by Seattle by Foot. The tour takes you throughout downtown Seattle visiting coffee shops and sampling drinks and some food. It is not only a great way to start a trip but it gives you a great overview of the city. The Aquarium. It is impressive. The Space Needle. The secret, book your lunch there. The cost of lunch includes admission to the sky deck. Take a trolley. Get a pass for the Emerald City Trolley. Get the pass that takes you to Fremont, Ballard and Queen Anne. Each neighborhood is worth exploring. Do a Market Ghost Tour. The tours have been a part of the community for decades and they offer a unique perspective on the Market, filling you with stories of the people and places that have created the Market as an international destination. It is often that people say they have only three days in Seattle. Our last recommendation is stay longer!